Distressing though it can be to lose your hair as an adult, it's nothing like as distressing as watching it happen to your child. Though it's rarely talked about, hair loss in infancy is actually quite common. As when anything else appears to go wrong with a baby, you should consult a doctor straight away, but don't panic – infant hair loss is rarely a sign of serious problems and is almost always temporary. Most babies are born with a small amount of fine hair on their heads, but some are born bald, in which case hair usually grows in within three months. It is normal, however, for this first head of hair to fall out almost completely within another three months. Sometimes, by that point, more hair has grown in, and sometimes it hasn't, leading to sudden baldness. In adults, hair usually goes through growth spurts interspersed with resting stages. This means that there are periods when no new hair grows but old hair is still falling out. When there's already a lot of hair on the scalp, we don't usually notice the hair thinning. On a baby, early hair can fall out before any further hair has grown in to replace it. Because hair growth cycles quickly adjust, and because hair that grows in later is usually stronger and more resilient, this type of hair loss usually only happens once. It doesn't mean that your baby is likely to have problems with hair loss later on in life. Often the second growth of hair on a baby is a completely different colour and type from the first set. This is normal and should be no cause for alarm. Sometimes, rather than seeing all your baby's hair fall out at once, you'll find that it disappears in patches. The most common reason for this is simply that your baby is rubbing hair off its scalp as it moves around in its sleep. Because the hair is delicate it can easily be tugged out at the roots by this kind of movement. There is nothing you can do to prevent this kind of hair loss occurring. Putting your baby to sleep on its front is a bad idea as it has been shown to increase the risk of SIDS. You shouldn't worry, however, as the problem usually goes away when the baby's muscles grow stronger and it is able to move itself around and sit up more easily. Sometimes autoimmune conditions or infections can cause patchy hair loss, so you should consult a doctor if the problem persists. All these problems can be treated and most infections can be quickly cured. The other common cause of infant hair loss is a condition called cradle cap. This occurs as a side effect of the speed at which babies grow. Rapid growth of skin cells on the scalp means that old skin builds up and new skin is sometimes fragile, leading to a reddish rash and crusty sores that sometimes bleed. Due to the skin problems caused by cradle cap, hair often becomes loose and falls out, This may be worse if your baby scratches. Once you have a clear diagnosis, however, there is no need to worry. You can ease the symptoms of this condition by massaging your baby's head with olive oil, which will soften the skin and help to prevent the development of sores. Most babies with cradle cap grow out of it by the age of eight months. New babies often lose their hair as a result of the hormone changes that occur after birth – the same way Pregnancy Can Cause Hair Loss. This should not be a cause for concern as their hormones should soon stabilise. 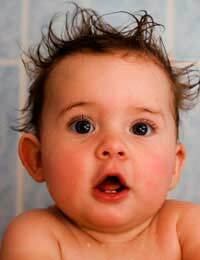 In a few cases, babies have hormone problems of their own which sometimes show up as hair loss. These can be a serious problem but are usually quite treatable. Like pregnant women, babies can easily lose their hair due to deficiencies in their diet. Providing a healthy, balanced diet will help your baby's hair to grow in strong and will set it up well for the rest of its life. For advice on children and hair loss, read our article How To Handle Hair Loss In Children on this site.